Just a quick note to let you know that we do not meet in January. 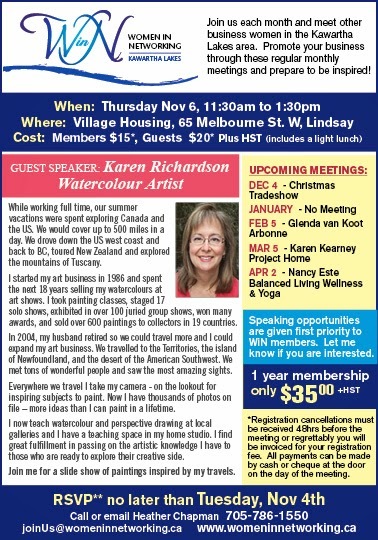 Regular meetings will begin on Thursday, February 5th and Glenda van Koot will be our guest speaker. Full details to follow shortly. Wishing you a very healthy, safe and happy 2015! Our December meeting/tradeshow will be held at the same location - Village Housing, Community Care Building. If you have not already RSVP'd please let me know if you will be attending and if you would like a spot to display your business and/or products. Display’s are open to members and you must provide your own small table. The cost for the December meeting is the same for both members and guests, $17 (includes HST) and can be paid by cash or cheque at the door or by e-transfer to joinus@womeninnetworking.ca. The cost for a display spot is a $5 donation which will go to a local charity. Note: I must have 36hrs notice for any cancellations or regrettably you will be invoiced for your registration. I will be accepting non-perishable food items to bring to KL Food Source after the meeting as there is such a great need this time of year. Our October WiN meeting is scheduled for Thursday, October 2nd. Our guest speaker is Monique Howat, Motivational Speaker, and she will be talking about “How to have staying power in biz…EXPOSED!” Full details below. 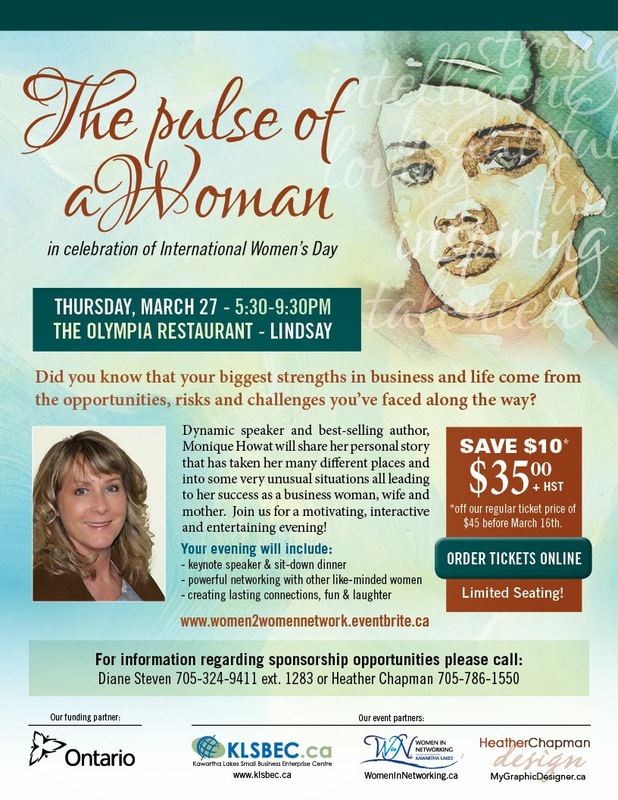 Please let me know if you are planning to attend by forwarding an email to joinus@womeninnetworking.ca. Hello everyone, I hope you all had a wonderful long weekend…. Welcome to September!! Please let me know if you are planning to attend this Thursday's meeting. 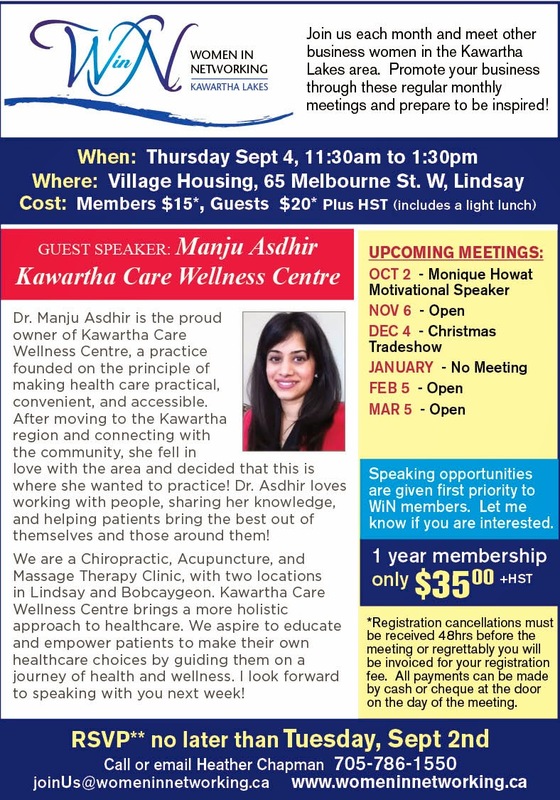 Our guest speaker is Manju Asdhir of Kawartha Care Wellness Centre (full details below). A quick reminder that our August WiN meeting is Thursday, Aug 7. 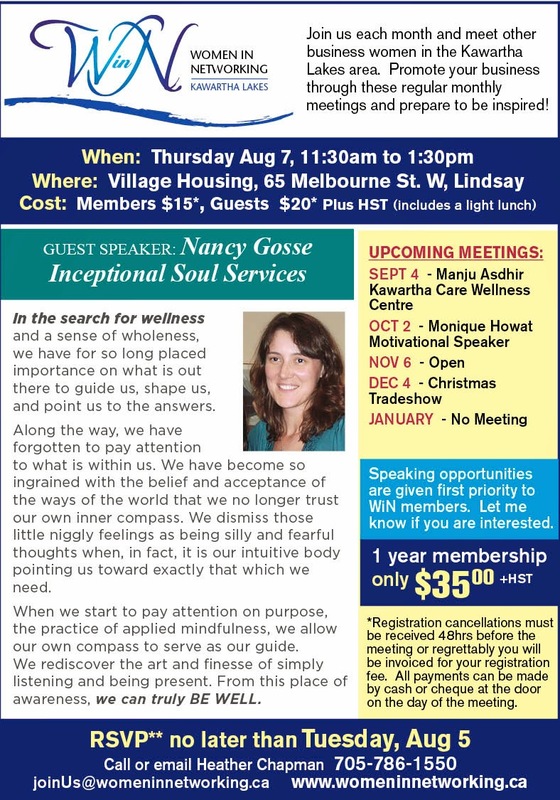 Our guest speaker is Nancy Gosse of Inceptional Soul Services and she will be talking about “Wellness" and the practice of "Applied Mindfulness”. See below for full details. Please reply to this email if you will be attending. Deadline for registration/cancellation is Tuesday, Aug 5. I look forward to seeing everyone! Please pass along to those you think may be interested. Sharon Summers - Right At Home Realty Inc. Please let me know if you are planning to attend Thursday’s WiN Meeting. 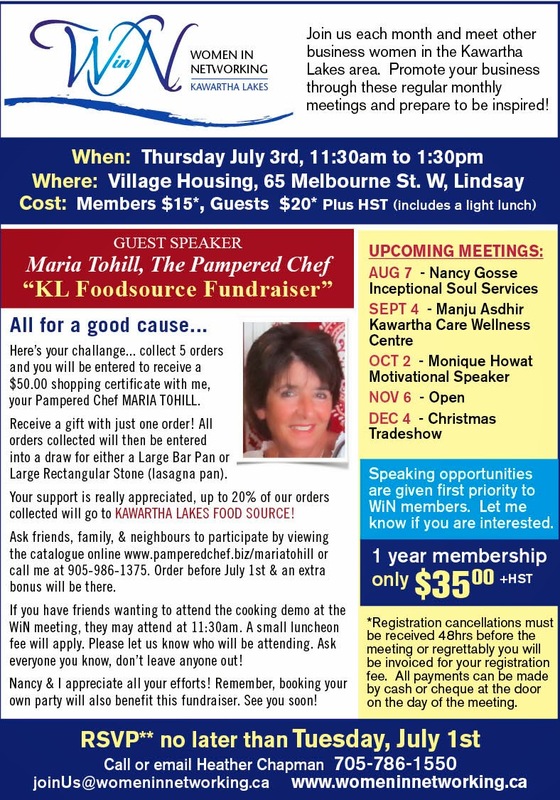 Our guest speaker is Maria Tohill, your Pampered Chef, full details below. Thanks to those who have already replied, see the “Who’s Coming” list below for confirmation of your registration. Just a reminder to save the date for our upcoming June 5th WiN meeting and circulate the flyer to anyone you think may be interested. 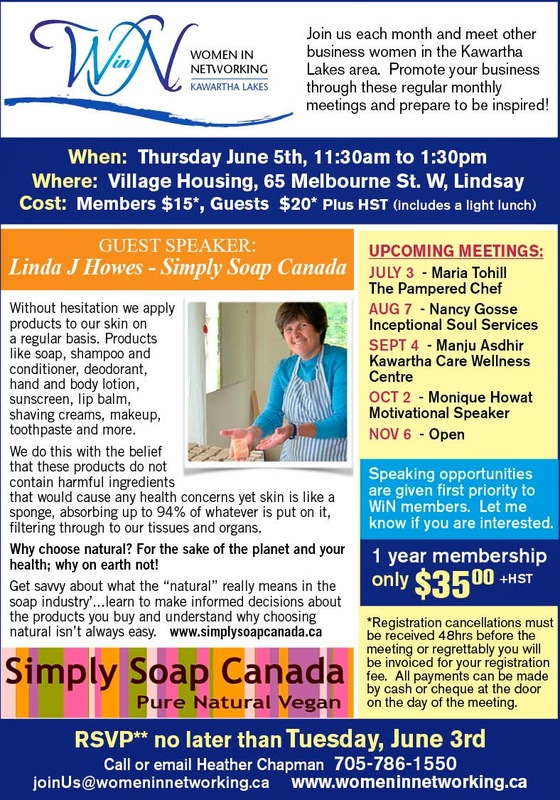 Our guest speaker is Linda J Howes of Simply Soap Canada, full details below. Please email me by Tuesday, June 3rd to let me know if you will be attending. **Please note that any cancellations must be received 48hours prior to the meeting or regrettably I must invoice you for the registration fee to cover catering and room costs. I look forward to seeing everyone on the 5th! If you are planning to attend Thursday’s WiN meeting please let me by Tuesday, April 29th. 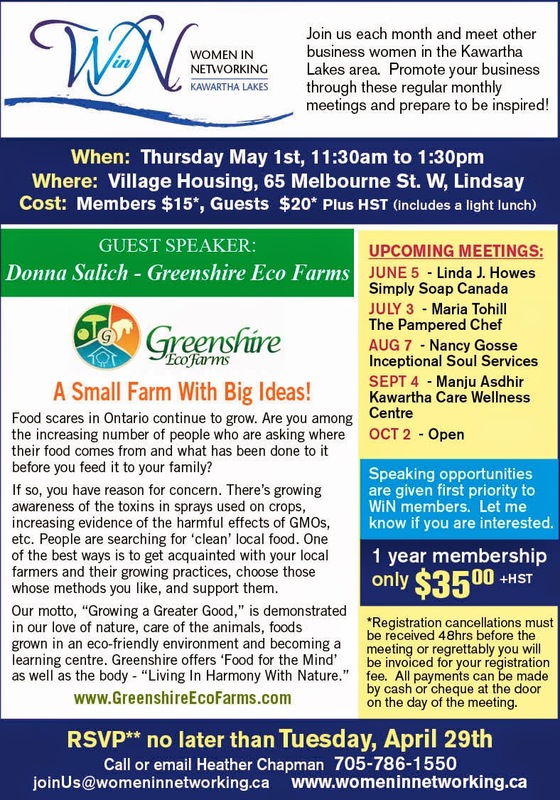 Donna Salich of Greenshire Eco Farms will be our guest speaker, full details below. I look forward to seeing everyone this Thursday! Our next WiN meeting is scheduled for Thursday May 7th. Our guest speaker is Nancy Gosse of Inceptional Soul services. WiN meetings run on the first Thursday of each month from 11:30am to 1:30pm at the Community Care, Village Housing building in the community room. TICKETS ARE OVER 25% SOLD! Kawartha Lakes Small Business and Entrepreneurship Centre and Women In Networking are partnering for the second time to bring to you an event where you will meet, celebrate and learn from women in business and in life! Get your tickets early as seating is limited and tickets will sell out fast! Order online at women2womennetwork.eventbrite.ca. I look forward to seeing you there! We will be meeting this Thursday, March 6th. Please let me know if you are planning to attend by end of day Tuesday, March 4th. Please ensure your name is on the “Who’s Coming” list below if you are planning to attend. I will be introducing you to a different meeting format Thursday. Looking forward to seeing everyone! For those of you who have any announcements to make (ie. upcoming events, etc.) please let me know before the meeting. I hope you are staying warm and cozy in this cold Canadian winter of ours! A quick reminder that our regular monthly WiN meetings start up again on Thursday, Feb 6th! Our guest speaker is Nancy Este of Balanced Living Yoga and Wellness. Full details below. Note: If you are a WiN member and are interested in being a guest speaker please let me know. Hello Ladies and Happy New Year! Just a quick reminder that we do not meet in January. 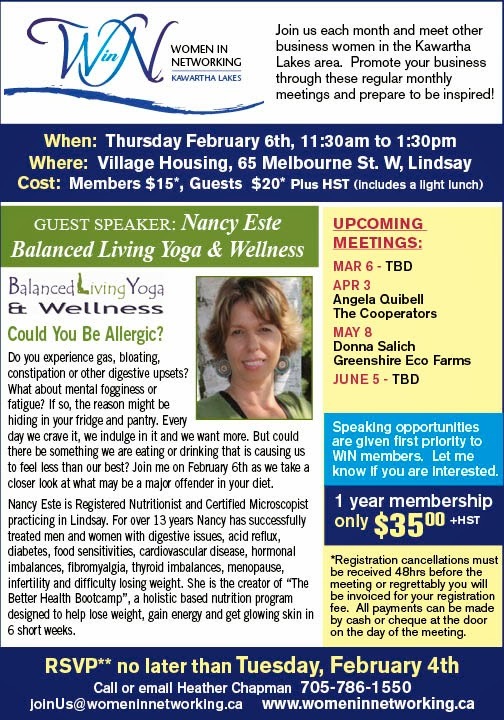 Our next meeting will be Thursday, February 6th and our guest speaker will be Nancy Este of Balanced Living Yoga & Wellness. I will be sending out more details in the next few weeks but be sure to save the date!